How and why was women's day organised? In 1910, at the Second International Conference of Working Women, Clara Zetkin  brought forward the question of organizing an International Working Women's Day. The conference decided that every year, in every country, they should celebrate on the same day a "Women's Day" under the slogan "The vote for women will unite our strength in the struggle for socialism". During these years, the question of making parliament more democratic, i.e., of widening the franchise and extending the vote to women, was a vital issue. Even before the first world war, the workers had the right to vote in all bourgeois countries except Russia. Only women, along with the insane, remained without these rights. Yet, at the same time, the harsh reality of capitalism demanded the participation of women in the country's economy. Every year there was an increase in the number of women who had to work in the factories and workshops, or as servants and charwomen. Women worked alongside men and the wealth of the country was created by their hands. But women remained without the vote. After January 11, efforts were made in Germany and Austria to prepare for Women's Day. They made known the plans for a demonstration both by word of mouth and in the press. During the week before Women's Day two journals appeared: The Vote for Women in Germany and Women's Day in Austria. The various articles devoted to Women's Day – "Women and Parliament," "The Working Women and Municipal Affairs," "What Has the Housewife got to do with Politics? ", etc. – analyzed thoroughly the question of the equality of women in the government and in society. All the articles emphasized the same point: that it was absolutely necessary to make parliament more democratic by extending the franchise to women. The first International Women's Day took place in 1911. Its success succeeded all expectation. Germany and Austria on Working Women's Day was one seething, trembling sea of women. Meetings were organized everywhere – in the small towns and even in the villages halls were packed so full that they had to ask male workers to give up their places for the women. The Russia working woman first took part in "Working Women's Day" in 1913. This was a time of reaction when Tsarism held the workers and peasants in its vise like a grip. There could be no thought of celebrating "Working Women's Day" by open demonstrations. But the organized working women were able to mark their international day. Both the legal newspapers of the working class – the Bolshevik Pravda and the Menshevik Looch – carried articles about the International Women's Day:  they carried special articles, portraits of some of those taking part in the working women's movement and greetings from comrades such as Bebel and Zetkin. The first world war broke out. The working class in every country was covered with the blood of war. 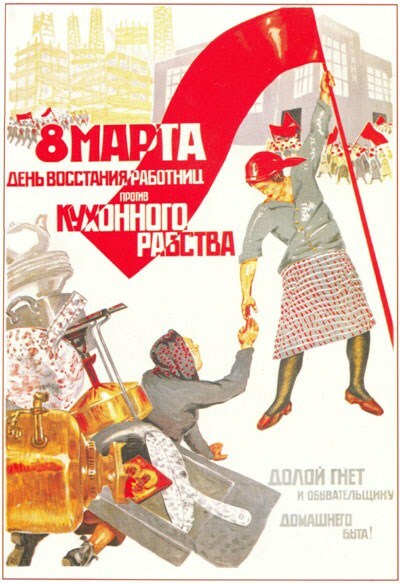 In 1915 and 1916 "Working Women's Day" abroad was a feeble affair – left wing socialist women who shared the views of the Russian Bolshevik Party tried to turn March 8th into a demonstration of working women against the war. But those socialist party traitors in Germany and other countries would not allow the socialist women to organize gatherings; and the socialist women were refused passports to go to neutral countries where the working women wanted to hold International meetings and show that in spite of the desire of the bourgeoisie, the spirit of International solidarity lived on. Then came the great, great year of 1917. Hunger, cold and trials of war broke the patience of the women workers and the peasant women of Russia. In 1917, on the 8th of March (23rd of February), on Working Women's Day, they came out boldly in the streets of Petrograd. The women – some were workers, some were wives of soldiers – demanded "Bread for our children" and "The return of our husbands from the trenches." At this decisive time the protests of the working women posed such a threat that even the Tsarist security forces did not dare take the usual measures against the rebels but looked on in confusion at the stormy sea of the people's anger. And to quicken this coming, we have first to put right Russia's shattered economy. We must consider the solving of our two most immediate tasks – the creation of a well organized and politically conscious labor force and the re-establishment of transport. If our army of labor works well we shall soon have steam engines once more; the railways will begin to function. This means that the working men and women will get the bread and firewood they desperately need. Last year the slogan of the Day of Women Workers was: "All to the victory of the Red Front." Now we call working women to rally their strength on a new bloodless front – the labor front! The Red Army defeated the external enemy because it was organized, disciplined and ready for self sacrifice. With organization, hard work, self-discipline and self sacrifice, the workers' republic will overcome the internal foe – the dislocation (of) transport and the economy, hunger, cold and disease. "Everyone to the victory on the bloodless labor front! Everyone to this victory!" In Germany, after the Kaiser had been thrown out and a bourgeois republic established, headed by the "compromisers,"  thirty-six women entered parliament – but not a single communist! Mr. Bourgeois, sir - it is too late! Away with the inequality, lack of rights and the oppression of women - the legacy of the bourgeois world! Forward to the international unity of working women and male workers in the struggle for the dictatorship of the proletariat - the proletariat of both sexes!